For various reasons this review of The Eradication of Schizophrenia in Western Lapland comes over a week after experiencing the production at the Battersea Arts Centre. Often, as a reviewer flits from theatre to theatre, trying to write a review after such a delay can be troublesome as images from different plays begin to blur together in the mind. 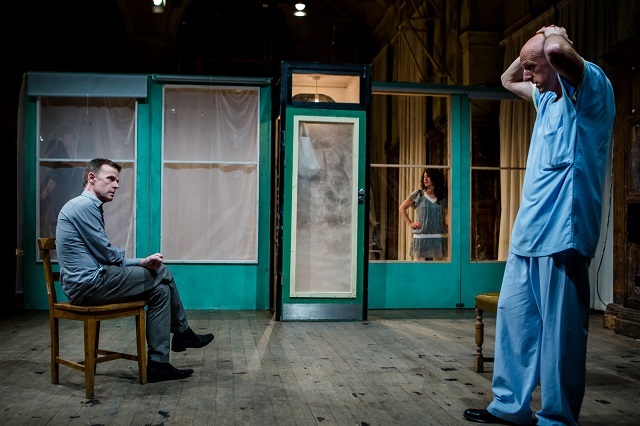 This isn’t a problem for Ridiculusmus’ The Eradication…, which pulls of a coup de théâtre with their simple but brilliantly effective approach to staging. 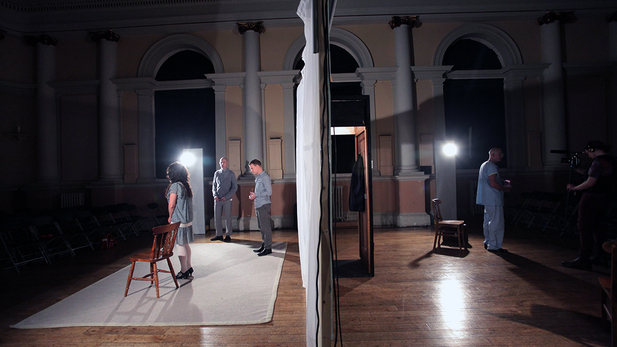 In portraying a family being pulled apart by the spectre of mental illness, Ridiculusmus’ decision to split the audience in half, dividing the stage with a simple screen and performing two overlapping narratives, isn’t just a technical device to garner attention on the highly competitive fringe circuit but exists to act as a mechanism to enable the audience to step inside the fog of psychosis. Creating a shared understanding is one of the big challenges to changing perceptions on mental illness. Most people have suffered injury or been physically ill at some point in their lives, and as a result they are able to draw on this experience, however limited, in order to shape their understanding and build a connection to those with a terminal disease or with a physical disability. However if a person has never experienced a mental health illness then it is very difficult to associate with any description on the pressures on a fragile psyche, and in turn the best that can be offered is glib and often wildly inaccurate approximations. 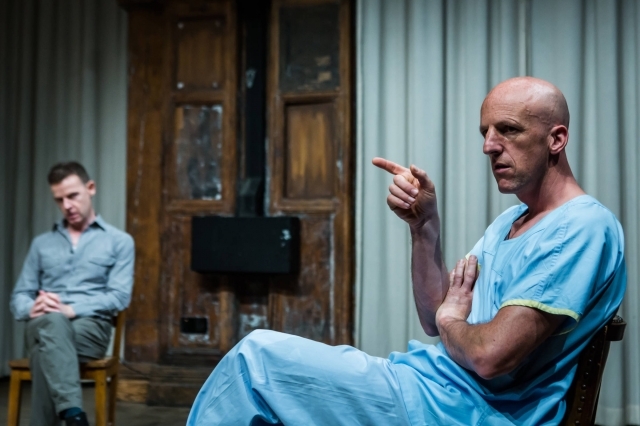 Ridiculusmus’ approach to staging brings an audience about as close to the reality of mental illness as it is possible to get. Separated from half the on-stage action but with the dialogue bleeding through the divide – sometimes appearing to interlink with the scene you are watching, at times talking over it and on other occasions hearing it only as a background hum – it recreates, in the audience, the polyphonic chorus that accompanies many people entering schizophrenic psychosis. Having working in mental health, it is very interesting to watch fellow audience members react and adjust to the world that we are presented with. To begin one can sense the bafflement and hear ripples of nervous laughter as we hear apparently comic dialogue from the other scene whilst directly watching a scene involving what appears to be a psychiatrist-patient relationship, but with the roles only loosely defined. As the first half progresses these early sensations are replaced increasingly by those of intense concentration and frustration as people try to get a handle on what they are being presented with. At the interval we are left dislocated and unsure. The most common question seemed to be ‘what is going on?’ This wasn’t aimed in anger at the production but a genuine desire to see how the second half, where the audience switches and see you the side of the stage that was previously blocked off, would shed light on the first. There can be few better ways of enabling the audience to step into the shoes of someone experiencing a mental health crisis than to force them into asking the question ‘what is going on?’, to create in them a sense of only grasping fragments of a whole and of desperately hoping that there is answer just out of reach. Whether the play reaches a neat and tidy conclusion is beside the point for when is life neat and tidy? Open Dialogue therapy, which inspired this work, uses ideas outlined by Mikhail Bakhtin about the self being defined through the context of other people’s understanding and how identity is a mutable, shifting construct. In this world a person’s life experience can never be captured in a finite moment, and in The Eradication… we leave the theatre at the end having travelled almost nowhere in terms of linear narrative development, but having emerged with a vastly richer, more textured understanding of humanity. The Eradication of Schizophrenia in Western Lapland is not a perfect production, and performances and script could be tightened in places, but it is brave, experimental theatre that doesn’t just try to be different but works to blur the line that separates differentness from normality.